It seems like we've just gotten started on our Merry & Bright Holiday Home Tour and here we are with our last installment! Today, we are all sharing an array of seasonal decor across our blog tour. If you've stopped by from Love Your Abode I'm especially glad you are here! 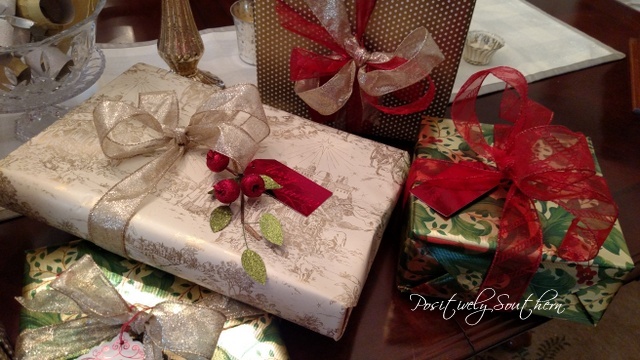 There are so many aspects of my Christmas decor I want to share with you today! Let's start with these gorgeous boxwood wreaths that we were gifted from Silk Plants Direct for being part of this blog hop! You can read all about it in my post on Monday here. The wreaths finished out the theme of natural greenery through our home. You can expect to see them in the future throughout our home. This tablescape is quite frankly the one I've like the most this season. I've scheduled a get together with a few of our closest friends just so I can use it! The beaded place mats were a splurge this fall from...you guessed it Pier 1 Imports! You are going to see the ALOT on them blog as I have fallen head over heels in love with these! If you don't have these....you need them! Trust!! The galvanized chargers went clearance and those too just had to complete the look. Those 2 elements will go with just about any style. A truthful moment, I set the table with everything except a centerpiece. I walked all over the house, looked in the attic and then I glanced at the coffee table. The lantern that was on the coffee table now needed to make a guest appearance on the kitchen table! Seriously ya'll, I love using the same element in various locations throughout the house. I rarely buy anything that doesn't have a two fold purpose! I took a few ornaments off the tree and tossed those on the table and it was just as if I had planned it that way! 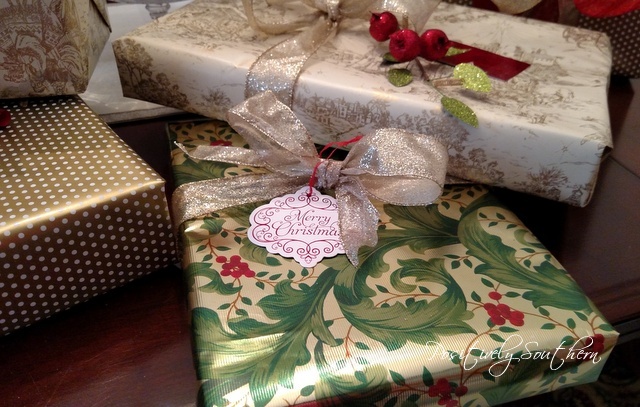 Let's talk about gift wrap for a minute. I've mentioned early in our tour that Paper Mart had gifted us our selection of wrapping paper. Ya'll this paper is amazing! It is the perfect weight of paper. Their selection is enormous! As soon as I saw the toile.....ya'll know that was gonna be my must have! There has never been a toile anything that I didn't adore! But the green berry foil, gave the toile a good run for her money! This paper was the easiest to use, as all foils are! Then I saw the gold and cream dot. This would be the most versatile of all the gift wrap I was selecting. This paper I could use all year long, for any occasion! Remember I'm a multipurpose gal! 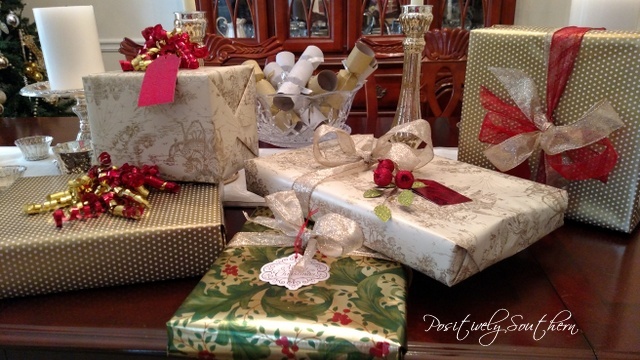 When I was selecting my gift wrap and bows, I absolutely took into consideration the colors I was using in my Christmas decor. I believe it all compliments so very well. 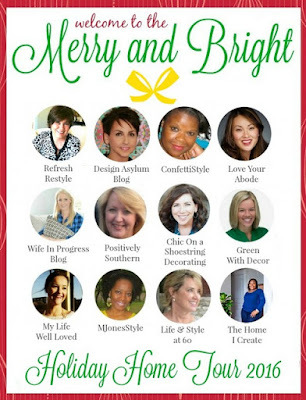 I sincerely hope that all the homes featured in our blog hop will inspire you as you decorate your home for the holidays! It has been such a joy to share our home with all of our readers. Now don't miss what Jenna at Wife In Progress, has in store. She has such great style I know you will find great inspiration there! So Christmasy! And your fireplace mantel is beautiful. Love the gold. Beautiful Tamyra. Those wreaths look stunning on your french doors and your table setting is so elegant. What a special treat your friends will have when they sit down at the table. 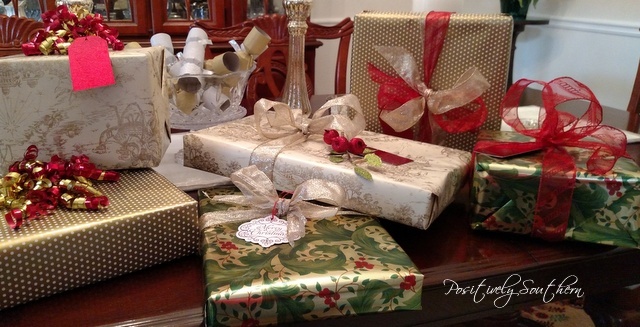 Tamyra, love the beautiful gift wrap choices and the magnolia leaf accents! Ho Ho Ho! These Santa belt napkin ring holders are to die for! Your home is gorgeous! What a beautiful holiday home tour! I love your attention to detail . . . like the coordinated gold ribbon. Everything is lovely and festive.